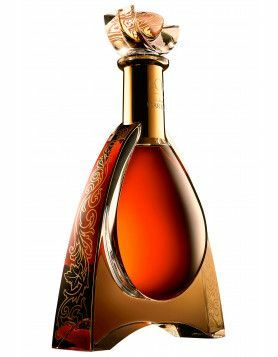 While many people think that branding is a relatively new marketing strategy in the cognac industry, a look back through the history of cognac shows that it’s a tradition that’s been many years in the making. Back in the mid-1700s, merchants of British descent settled in the region of the Charente – and around the town of Cognac in particular. 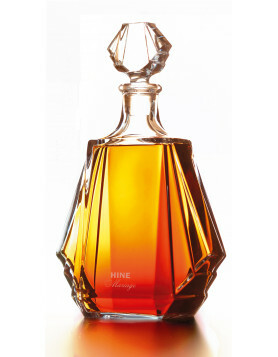 It was thanks to these commercial minds, along with the agricultural strength and industrial talents of the producers of eaux-de-vie, that cognac became the worldwide name it is today, compared to, for example, its much lesser known cousin armagnac – produced in Gascony – which has nowhere near the universal appeal or market reach as cognac does. 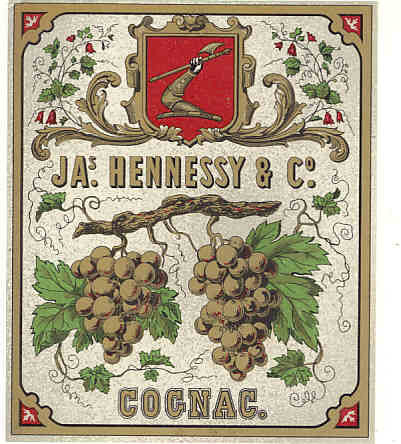 Once the popularity of cognac began to grow, the major producers began to realize that they needed something to identify their brand – an emblem – in order to protect their name. This occurred way before the modern concept of trademark or branding. Here are some of the legends used to create the emblems that are now the hallmark of top-quality cognacs. The number one cognac emblem is of an arm holding a hatchet. This is taken from the crest of the founder of the cognac house – Richard Hennessy (1724-1800). The crest of arms originally included a wild pig and the motto “vi et armis vivo” that means “I live by force and by arms.” However, the pig was removed from the emblem because it was considered to be not commercial enough. Richard Hennessy lived a military life, and fought Protestants in the Irish Brigade of Louis XV. With its emblem of the centaur, Remy Martin’s distinguishing mark was chosen in 1903 by Emile Rémy Martin (1810-1875) and his son, Paul (1853-1924). Indeed, the mark is so well known in China that they don’t request a glass of Remy Martin, instead they ask for “ren-ma-tao” (one man horse), a powerful symbol of virility, long life and health. The emblem of the swift can be traced back the house’s founder – John Martell (1694-1753) and his love of watching the birds. Apparently it reminded him of his childhood home in Jersey, Channel Islands. 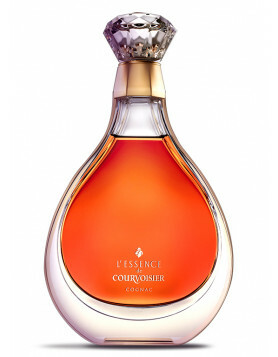 He was, in 1715, the first foreigner to settle and engage in trade from Cognac. And he was definitely an entrepreneur of his time, selling a variety of products including stockings, petticoats, coal and tulip bulbs. Indeed, faced with the actual hat Napoleon wore at the 1807 Battle of Friedland and his grey coat purchased by Hennessy at great expense from Sothebys, what tourist could fail to be enamoured by this story. 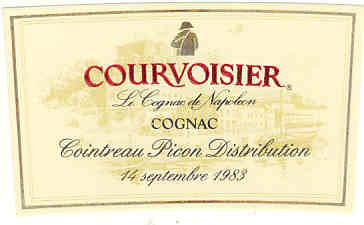 But if the truth be known, the history of Courvoisier only dates back to the year 1835, and Napoleon was exiled to St Helena in 1815. The trademark of Napoleon was actually an advertising legend fabricated by the Simon Brothers in the year 1909. But it’s still a nice story! The emblem of Camus Cognac is often mistaken for a clover – but it is actually a Trefoil Cross. Referred to by Camus as ‘Le Grande Marque,’ the symbol was very popular in Russia, worn by, if legend is to be believed, Gaston, the son of John the Baptist when hunted polar bears in the company of Tsar Nicholas II. The Trefoil Cross is actually reminiscent of the old key to the cellar of the ancestral home of the Camus family – Chateau du Plessis, Saint-Sulpice-de-Cognac. In 2005 the emblem was modernised and stylised to what we know today. 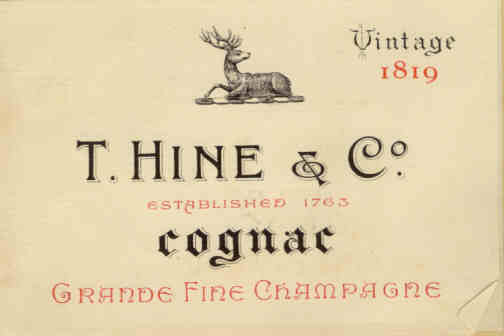 A lying deer is the emblem of Hine cognac. There has been much speculation over the years as to the story behind the mark – many believing that it’s a play on the word ‘hind’ – an old English word for deer. Any idea what type of axe is pictured in the Hennessy logo? I imagine it is a 16th-18th century french battle axe because of the time period Richard Hennessy joined the Irish Brigade in the French Army. Does the style of axe have a name and is the axe pictured a ceremonial axe or one that would have been used in battle? thanks for the comment and your interest. Unfortunately, I am not able to tell you anything further about the history of this axe and the way it has been used. My guess is that it might have been used mostly for military purposes. Richard spent a lot of time in the war and therefore maybe this is where it comes from. Good luck with the research! I’m trying to identify the cognac associated with this tasting glass. The logo or emblem on the glass is in gold and nearly faded away, but has a D and I on either side of a crest type emblem with two gold fill lines near the base, as shone in photo. Any ideas? Thanks. Thanks for your comment. Unfortunately, our team is not able to help you with this matter.